Many Forest Invasive Alien Species (FIAS) are threatening Canada’s Forest. In the bioSAFE Project, we will be researching two pests and two pathogens. The bioSAFE project is taking a two-fold approach in the development of its biosurveillance tools. The approaches being used are: (1) determine the global distribution of the organism in order to map out the likely source of the pest or pathogen, and (2) analyze the functional characteristics that allow the pest or pathogen to spread and survive in their non-native locations. The key in the second approach is to identify markers of Fitness and Outbreak-Related Epidemiological (FORE) traits in forest insect or pathogens outbreaks which represent a highly valuable goal for current and future risk mitigation efforts and monitoring. There are some traits that can be clearly associated with invasiveness and could be useful in predicting some aspects of outbreaks. Virulence and host range in pathogens, and flight capacity and overwintering capacity in insects have been related to global outbreaks or risk of epidemics and are likely to be heritable and, therefore, amenable to genetic and genomic analyses. These traits are likely to be genetically complex and will require multiple approaches to find associated markers with sufficient predictive power. Here is a basic introduction of the four organisms the bioSAFE project is tackling and what our scientist will be studying. 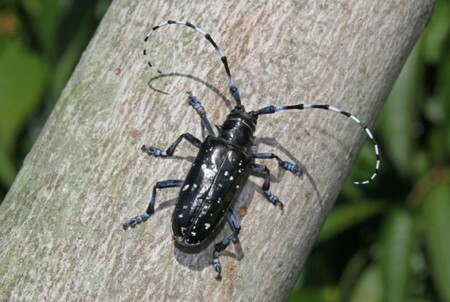 Asian longhorned beetle (ALB) is a wood-boring insect native to China and Korea. It is an invasive forest pest that attacks nearly all broadleaf trees in North America, but shows a preference for native maples. Eggs are laid in hardwood trees and larvae tunnel through the living tissue interrupting water and nutrients transport leading to tree death. It can be easily transported in firewood, live trees or untreated lumber wood such as packing material used in shipping, making it extremely challenging to prevent incursions. ALB was first introduced to North America in the 1990s and suspected to have been introduced in solid wood packaging materials, such as crates or pallets. In 2003, ALB was discovered for the first time in Canada in an industrial park in the Toronto area. An intensive eradication program was initiated to remove host trees within a quarantine zone around the infestation to prevent further spread. ALB was not detected in Ontario from 2007 to 2012; however in 2013, another ALB infestation was detected in Toronto. Eradication and detection efforts were initiated for a second time as a result of the find. A five-year monitoring survey is currently ongoing to determine success of eradication efforts. Identifying the source of new introductions of ALB will enhance pathway analysis and lead to improvements in the regulatory and import control systems. By generating genomic profiles of new finds and comparing them with previous outbreak samples and global profiles, we will be able to assess mitigation success. We will generate a global ALB collection by sampling from native (see figure) and invasive ranges (North America and Europe). To understand ALB’s success in spreading and overwintering, we will study candidate genes that are associated with cold tolerance of ALB. The approach is to induce diapause and cold tolerance in lab-reared ALB from different populations (native and introduced) to discover genes associated with diapause regulation and cryoprotectant synthesis. Work will be conducted at the Natural Resources Canada Insect Production and Quarantine Laboratory (IPQL) – the only Canadian facility certified to house ALB colonies. In addition, we will study the metabolic changes associated with diapause and compare these responses among populations. 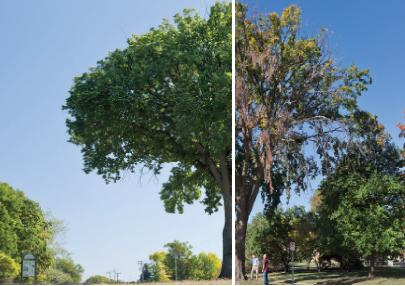 Since its introduction from Europe, Dutch elm disease (DED) has destroyed millions of elm trees across North America. The pathogen is spread by native and introduced bark beetles whose larvae tunnel under the outer bark of elm trees and create distinctive feeding galleries. The adult beetles spread the fungus into live trees, resulting in fungal proliferation in the trees’ tissues. The first introduction of DED was reported in 1930 and the disease reached Eastern Canada in the 1940's and Manitoba in 1975. The advancing front is now in Saskatchewan but the disease does not occur in Alberta or British Columbia. At least two pathogens, Ophiostoma novo-ulmi and O. ulmi cause the disease and have different virulence. These pathogens belong to the ophiostomatoid fungi, a group that includes other dangerous and quarantined pathogens such as oak wilt (Ceratocystis fagacearum), Japanese oak wilt (Raffaelea quercivora) and the black stain root disease of conifers (Leptographium wageneri). These fungi are vectored by beetles and can be easily transported in firewood and lumber. These fungi are of phytosanitary concern, and are monitored and managed by the CFIA. Intensive surveys are conducted annually in provinces on the advancing front, as well as in provinces where the pathogen is established. To reconstruct the global outbreak of DED we are going to analyse the genomic data of historical DED samples collected over many years. We will put together a historical evolutionary map based on the chronology of this global outbreak which will give us a unique look in the evolution and adaptation of DED and possibly other pathogens that have global outbreaks. Understanding what characterizes tree pathogens that cause large-scale outbreaks can provide predictive analytical and detection tools. The Dutch elm disease pathogens vary from highly virulent (O. novo-ulmi) to moderately virulent (O. ulmi) or mildly virulent (O. himal-ulmi depending on the host). We will search for virulence determinants in this disease using a genomics approach and develop markers predictive of virulence. Different methods to identify genomic regions associated with virulence in non-model plant pathogens will be applied to DED. We will do this by identifying candidate genes associated with virulence, temperature adaptation and substrate utilization. We will match the phenotypes against the variants seen in the genome sequences of the collection of DED samples. Phytophthora ramorum is an oomycete (a group of fungus-like microorganisms) that can attack over 100 host species, including several of our most valued tree species in Canada such as Douglas fir, larch and oaks. The most damaging diseases caused by this pathogen are sudden oak death (SOD) in California and Oregon and sudden larch death in England. This pathogen has killed hundreds of thousands of trees, affected landscape processes, and caused economic hardship in North America and Europe. The disease was discovered in nurseries in British Columbia in 2003, placing Canada’s forests at risk. Since this discovery, aggressive eradication and phytosanitary certification programs have helped contain the pathogen to a few nurseries in BC. The CFIA conducts inspections and annual surveys to identify the species and lineages using a combination of culturing of the pathogen and DNA assays developed through foundational research by this team. Current biosurveillance techniques cannot differentiate between novel introductions and existing infections that escaped eradication efforts in nurseries experiencing repeat occurrences. Differentiating between these scenarios will guide CFIA control measures. Available survey methods are also unable to reliably assign a pathogen sample to a source population. 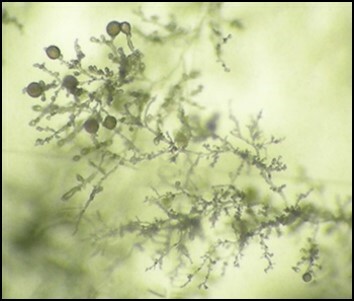 Biosurveillance of SOD is further complicated by their ability to hybridize, rapidly evolve, and in some cases jump hosts. None of these pathogenic innovations can be accurately monitored using existing biosurveillance and detection methods, so a comprehensive genomics approach would help address these challenges. We will conduct a retrospective genomic analysis of the Canadian populations across the years and nurseries to build an exhaustive database of genomic profiles of all known finds of P. ramorum in Canada. This will serve to conduct a genomic epidemiology analysis to track the Canadian SOD outbreak and identify sources and pathways. In addition, we will assess mitigation efficacy by comparing the genomic profiles of SOD isolated before and after eradication. We will be using hundreds of isolates of the pathogen ever discovered in Canada. This represents P. ramorum collected every year since 2003 on more than 80 hosts and varieties, including rhododendron, camellia, oak, maple and willows in 17 nurseries. We will analyse their differences including the study of the different lineages. Phytophthora ramorum possesses two traits that make it a remarkably dangerous pathogen for Canada’s forests and trees: the ability to attack hundreds of plant species and the ability to attack woody tissues. These characteristics are of particular concern to the international phytosanitary community since Phytophthoras possessing similar traits could be disseminated on wood products. We will compare phylogenetically related Phytopthora species with different FORE traits: multi host vs single host, weak vs aggressive attacks, woody tissues vs foliar. We will analyse their physical and biochemical profiles especially in particular gene families that increase the pathogenicity of the species. 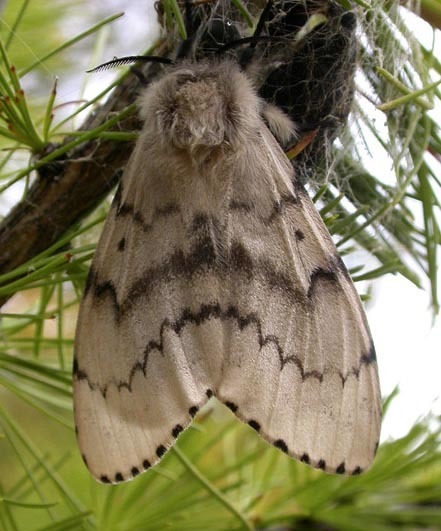 Asian gypsy moth (AGM) is a lepidopteran regulated in North America and Europe, and is one of the most threatening FIAS in Canada and the USA. It has a broad host range, attacking most species of deciduous and coniferous trees in Canada. Female AGM have a strong flight capacity and can lay eggs on any surface; egg masses are often found on container ships. An incursion of AGM in Canadian forests could affect not only the forestry and nursery sectors, but also other economic activities. For example, the shipping industry must ensure that vessels entering Canada do not carry AGM egg masses. When ships carrying goods are found non-compliant, they are turned away from Canadian waters, interrupting the flow of goods at the cost of the shipping company, affecting downstream industries that depend on product delivery, leading to further economic losses. Keeping AGM out of Canada requires inspection of vessels entering the country to ensure that they are free of egg masses and requires biosurveillance surveys around ports of entry to detect adults. When egg masses are discovered on non-compliant vessels it is important to identify them to determine which species they belong to and to ascertain their potential sources. The CFIA requires information about the origin of intercepted insects to improve phytosanitary procedures, regulations and compliance of shipping companies, and identify countries that represent higher risks. This information guides technical negotiations with our trading partners. Biosurveillance requires accurate identification of AGM at all life stages of the insect. Flight capabilities also differ between the established gypsy moth and the AGM but are hard to discern between hybrids. A molecular method to rapidly detect hybridization and predict flight capability in gypsy moth would guide CFIA management decisions. To serve as reference for tracking sources and assessing the level of hybridization in natural populations, we will develop a worldwide collection of Lymantria to generate genomic profiles. Using such profiles, we will generate a more powerful reproducible approach to define global population structure and monitor outbreak samples. We will take representative samples from various populations across the world creating an extensive coverage of the full geographic range of L. dispar, from Far East Russia to North America. Flight capacity is an important trait for invasive insects. In contrast to the European gypsy moth (EGM), AGM females are strong flyers, thereby facilitating spread, and the species mate to produce hybrids with varying degrees of flight capability. Introgression could generate individuals with increased flight capacity, in a largely European genetic background. Our experiments will search for candidate genes associated with flight capacity by looking at populations of parents and their progenies that will be functionally validated.